This entry was posted on 20th September 2018 by WoodBlocX. After the dry and very hot spell in June and July gardens across the UK suffered, with lawns drying out and plants in beds and borders turning an unsightly shade of brown. If this sounds like your garden then our latest competition is for you! We have teamed up with Garden on a Roll to help rescue your border. 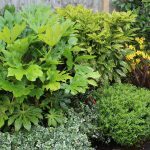 When planning a planting scheme for a border it can be difficult to work out how many plants to fill it with and which plants will look good together, this can result in over-spending on plants and a messy border. Garden on a Roll use the expertise of garden designers to select the plants that work best together and also show you where to plant them.